Area: 89,342 sq. km. (34,495 sq. mi.). Cities: Capital: Amman (pop. 2.5 million). Other cities — az-Zarqa (472,830), Irbid (272,681), al-'Aqaba (107,115). Nationality: Noun and adjective — Jordanian(s). Population (2011 estimate): 6.51 million. Religions (2001 census est. ): Sunni Muslim 92%, Christian 6%, other 2%. Education (2007, according to Jordan's Department of Statistics): Literacy: 92.1%. Health (2007): Infant mortality rate: 20/1,000. Life expectancy — 71.6 years male; 74.4 years female. Ethnic groups: Mostly Arab but small communities of Circassians, Armenians, and Chechens. Work force (1.8 million, of which 313,000 are registered guest workers): services 34%, manufacturing 20%, public sector 19%, education 12%, health and social services 11%, agriculture 3%. Unemployment rate (2008): 13% of economically active Jordanians. Constitution: January 8, 1952; amended October 1, 2011. Branches: Executive: King (chief of state), Prime Minister (head of government), Council of Ministers (cabinet). Legislative — bicameral parliament (appointed upper house known as the Senate, elected lower house). Judicial — civil, religious, special courts. Administrative subdivisions: Twelve governorates — Irbid, Jarash, Ajloun, al-'Aqaba, Madaba, al-Mafraq, az-Zarqa, Amman, al-Balqa, al-Karak, at-Tafilah, and Ma'an. Nominal GDP (2009): $21.92 billion. Annual real growth rate (2009): 3.2%. 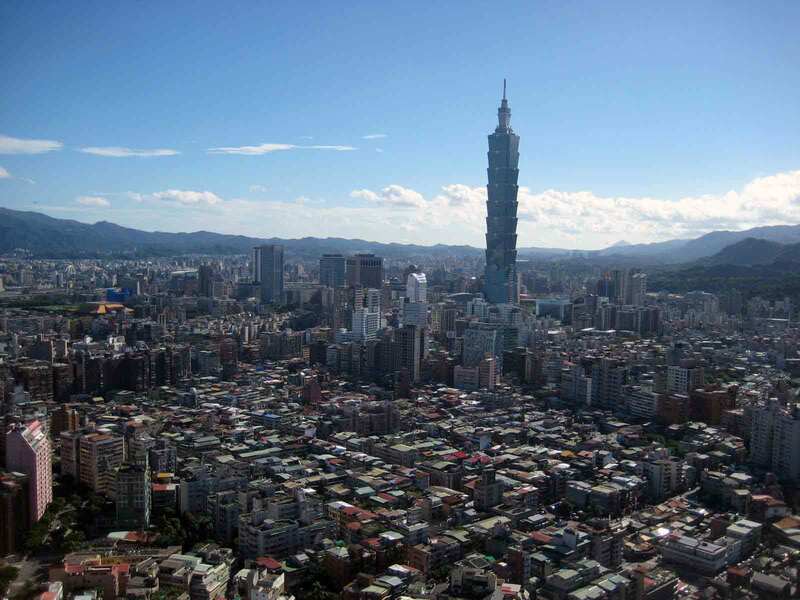 Per capita GDP (2009): $4,700. Agriculture (3.01% of GDP in 2009): Products — citrus, tomatoes, cucumbers, olives, sheep, poultry, stone fruits, strawberries, melons, dairy. Land — 4.5% arable; 2.5% cultivated. Industry (15.95% of GDP in 2009): Types — clothing, phosphate mining, fertilizers, pharmaceuticals, petroleum refining, cement, potash, inorganic chemicals, and light manufacturing. Trade: Exports (2009): $7.54 billion: garments, fertilizers, potash, phosphates, pharmaceutical products and vegetables. Major markets — India, U.S., Iraq, Saudi Arabia, EU, U.A.E., Syria, Israel. Imports (2009) — $16.12 billion: crude petroleum and derivatives, machinery and equipment, vehicles, iron, and cereals. Major suppliers — Saudi Arabia (mainly crude oil and derivatives), EU, China, U.S., Egypt, South Korea, Japan, Turkey. Note: From 1949 to 1967, Jordan administered the West Bank. Since the 1967 war, when Israel took control of this territory, the United States has considered the West Bank to be territory occupied by Israel. The United States believes that the final status of the West Bank can be determined only through negotiations among the concerned parties based on UN Security Council Resolutions 242 and 338. Jordanians are Arabs, except for a few small communities of Circassians, Armenians, and Chechens who have adapted to Arab culture. The official language is Arabic, but English is used widely in commerce and government. About 70% of Jordan's population is urban; less than 6% of the rural population is nomadic or semi-nomadic. Approximately 1.7 million registered Palestinian refugees and other displaced persons, including Iraqis, reside in Jordan. The land that became Jordan is part of the richly historical Fertile Crescent region. Around 2000 B.C., Semitic Amorites settled around the Jordan River in the area called Canaan. Subsequent invaders and settlers included Hittites, Egyptians, Israelites, Assyrians, Babylonians, Persians, Greeks, Romans, Arab Muslims, Christian Crusaders, Mameluks, Ottoman Turks, and, finally, the British. At the end of World War I, the League of Nations awarded the territory now comprising Israel, Jordan, the West Bank, Gaza, and Jerusalem to the United Kingdom as the mandate for Palestine and Transjordan. In 1922, the British divided the mandate by establishing the semiautonomous Emirate of Transjordan, ruled by the Hashemite Prince Abdullah, while continuing the administration of Palestine under a British High Commissioner. The mandate over Transjordan ended on May 22, 1946; on May 25, the country became the independent Hashemite Kingdom of Transjordan. It ended its special defense treaty relationship with the United Kingdom in 1957. Transjordan was one of the Arab states which moved to assist Palestinian nationalists opposed to the creation of Israel in May 1948, and took part in the warfare between the Arab states and the newly founded State of Israel. 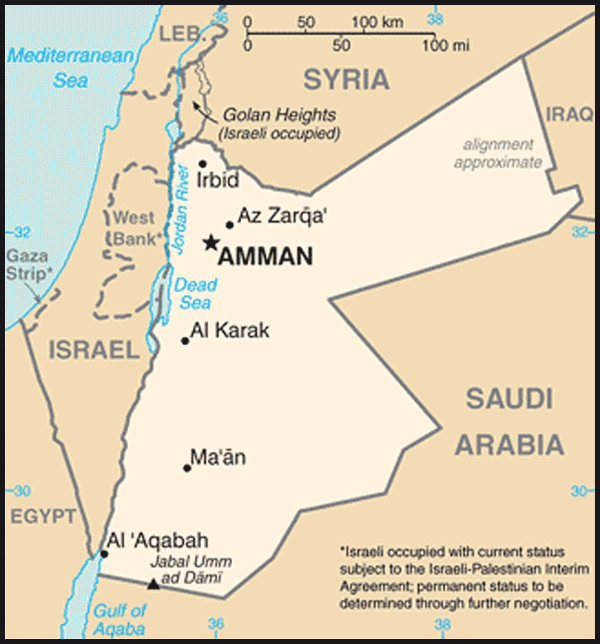 The armistice agreements of April 3, 1949 left Jordan in control of the West Bank and provided that the armistice demarcation lines were without prejudice to future territorial settlements or boundary lines. In 1950, the country was renamed the Hashemite Kingdom of Jordan to include those portions of Palestine annexed by King Abdullah I. While recognizing Jordanian administration over the West Bank, the United States maintained the position that ultimate sovereignty was subject to future agreement. Jordan signed a mutual defense pact in May 1967 with Egypt, and it participated in the June 1967 war between Israel and the Arab states of Syria, Egypt, and Iraq. During the war, Israel gained control of the West Bank and all of Jerusalem. In 1988, Jordan renounced all claims to the West Bank but retained an administrative role pending a final settlement, and its 1994 treaty with Israel allowed for a continuing Jordanian role in Muslim holy places in Jerusalem. The U.S. Government considers the West Bank to be territory occupied by Israel and believes that its final status should be determined through direct negotiations among the parties concerned on the basis of UN Security Council Resolutions 242 and 338. The 1967 war led to a dramatic increase in the number of Palestinians living in Jordan. Its Palestinian refugee population — 700,000 in 1966 — grew by another 300,000 from the West Bank. The period following the 1967 war saw an upsurge in the power and importance of Palestinian resistance elements (fedayeen) in Jordan. The heavily armed fedayeen constituted a growing threat to the sovereignty and security of the Hashemite state, and open fighting erupted in September 1970. No fighting occurred along the 1967 Jordan River cease-fire line during the October 1973 Arab-Israeli war, but Jordan sent a brigade to Syria to fight Israeli units on Syrian territory. Jordan did not participate in the Gulf war of 1990-91. In 1991, Jordan agreed, along with Syria, Lebanon, and Palestinian representatives, to participate in direct peace negotiations with Israel sponsored by the U.S. and Russia. It negotiated an end to hostilities with Israel and signed a peace treaty in 1994. Jordan has since sought to remain at peace with all of its neighbors. Jordan is a constitutional monarchy based on the constitution promulgated on January 8, 1952 and amended on October 1, 2011. Executive authority is vested in the King and his Council of Ministers. The King signs and executes all laws. His veto power may be overridden by a two-thirds vote of both houses of the parliament. He appoints and may dismiss all judges by decree, approves amendments to the constitution, declares war, and commands the armed forces. Cabinet decisions, court judgments, and the national currency are issued in his name. The King, who may dismiss other cabinet members at the prime minister's request, appoints the council of ministers, led by a prime minister. The cabinet is responsible to the lower house of parliament on matters of general policy and can be forced to resign by a two-thirds vote of "no confidence" by that body. Responding to popular demand set against the context of the Arab Spring, in February 2011 King Abdullah dismissed the cabinet and named a new prime minister, charged with pursuing democratic reforms. In March, the King established a National Dialogue Committee mandated with writing new laws governing political parties and elections, and in April he created the Royal Committee to Amend the Constitution. On August 14, King Abdullah announced proposed amendments to the constitution intended to strengthen the role of the judiciary and to enhance the rule of law. Parliament passed 40 of the 42 amendments, and the King accepted these changes. The amended constitution is now referred to as the October 1, 2011 Constitution. Parliament is working to enact the legislative framework to implement the constitutional changes as well as the political party and electoral laws recommended by the National Dialogue Committee. In October 2011, in response to popular frustration over the pace of reform and anger over a proposed municipal elections law, the King again dismissed the cabinet and named as Prime Minister Awn Khasawneh, who had been serving on the International Court of Justice. He also appointed a new director of the General Intelligence Directorate, and his letter mandating that the new director pursue reform within the intelligence services was leaked to the media. Legislative power rests in the bicameral parliament. The lower house of parliament, elected by universal suffrage to a 4-year term, is subject to dissolution by the King. The King appoints the 55-member upper house for a 4-year term. Jordan held elections for municipal councils and mayors in July 2007; 20% of the council seats were reserved by quota for women. New municipal elections are anticipated in mid-2012. The King dissolved parliament in November 2009; new elections were held November 9, 2010. Women hold 13 of the 120 seats, as one woman won a seat outright, above the new 10% quota for women. Only 25% of the current parliament held a seat in the previous parliament. The constitution provides for three categories of courts — civil, religious, and special. Administratively, Jordan is divided into 12 governorates, each headed by a governor appointed by the King. They are the sole authorities for all government departments and development projects in their respective areas. Jordan maintains an embassy (http://www.jordanembassyus.org/new/index.shtml) in the United States at 3504 International Drive NW, Washington, DC 20008 (tel. 202-966-2664). King Hussein ruled Jordan from 1953 to 1999, surviving a number of challenges to his rule, drawing on the loyalty of his military, and serving as a symbol of unity and stability for both the East Bank and Palestinian communities in Jordan. In 1989 and 1993, Jordan held free and fair parliamentary elections. Controversial changes in the election law led Islamist parties to boycott the 1997 elections. King Hussein ended martial law in 1991 and legalized political parties in 1992. King Abdullah II succeeded his father Hussein following the latter's death in February 1999. King Abdullah moved quickly to reaffirm Jordan's peace treaty with Israel and its relations with the U.S., and has since focused the government's agenda on economic reform, political development, and poverty alleviation. Jordan's continuing structural economic difficulties, burgeoning population, and more open political environment have led to the emergence of a variety of small political parties. In parliamentary elections held November 2007, the Islamist opposition lost many of the seats it had gained in 2003. In November 2009, the King dissolved parliament. New elections were held November 2010; the Islamist opposition boycotted these elections. New elections are anticipated in the fall of 2012, after the new independent electoral commission, authorized by the 2011 constitution, is named. Jordan is a small country with limited natural resources. It is among the most water-poor countries in the world. The country is currently exploring ways to expand its limited water supply and use its existing water resources more efficiently, including through regional cooperation. Jordan also depends on external sources for the majority of its energy requirements. During the 1990s, its crude petroleum needs were met through imports from neighboring Iraq, often at concessionary prices. Since early 2003, Jordan has imported oil primarily from Saudi Arabia at concessionary and market prices. In addition, a natural gas pipeline from Egypt to Jordan through the southern port city of Aqaba is now operational. The pipeline has reached northern Jordan and construction to connect it to Syria and beyond is underway. Jordan developed a new energy strategy in 2007 aiming to develop more indigenous and renewable energy sources, including oil shale, nuclear energy, wind, and solar power. Under King Abdullah, Jordan has undertaken a program of economic reform. The government has eliminated most fuel and agricultural subsidies, passed legislation targeting corruption, and begun tax reform. It has also worked to liberalize trade, joining the World Trade Organization (WTO) in 2000; signing an Association Agreement with the European Union (EU) in 2001; and signing the first bilateral free trade agreement (FTA) between the U.S. and an Arab country. Under the terms of the U.S.-Jordan FTA, which entered into force in 2001, the United States and Jordan agreed to phased tariff reductions culminating in the complete elimination of duties on nearly all products by 2010. The agreement contains labor and environmental provisions, and also provides for more open markets in communications, construction, finance, health, transportation, and services, as well as the strict application of international standards for the protection of intellectual property. In 1996, the U.S. Congress created Qualifying Industrial Zones (QIZ) to support the peace process. QIZ goods, which must contain a certain percentage of Israeli input and enter the United States tariff- and quota-free, have also driven economic growth, particularly in the export of light manufactured products such as garments. Jordan exported $6.9 million in goods to the U.S. in 1997, when two-way trade was $395 million; according to the U.S. International Trade Commission, it exported $796.2 million in the first 10 months of 2009, with U.S. exports to Jordan valued at $976.9 million and two-way trade reaching $1.77 billion. In 2009, Jordan's economy continued to grow slightly but was hurt by lower than expected revenues and slower growth due to the global financial crisis. In 1996, Jordan and the United States signed a civil aviation agreement that provides for "open skies" between the two countries, and a U.S.-Jordan Bilateral Investment Treaty (BIT) for the protection and encouragement of bilateral investment entered into force in 2003. The United States and Jordan also signed in 2007 a Science and Technology Cooperation Agreement to facilitate and strengthen scientific cooperation between the two countries, as well as a memorandum of understanding on nuclear energy cooperation. Such agreements bolster efforts to help diversify Jordan's economy and promote growth, and at the same time lessen reliance on exports of phosphates, potash, and recently textiles; overseas remittances; and foreign aid. The government has emphasized the information technology (IT), pharmaceuticals, and tourism sectors as other promising growth sectors. The low tax and low regulation Aqaba Special Economic Zone (ASEZ) is considered a model of a government-provided framework for private sector-led economic growth. Jordan is classified by the World Bank as a "lower middle income country." The per capita GDP is $4,700. According to Jordan's Department of Statistics, almost 13% of the economically active Jordanian population residing in Jordan was unemployed in 2008, although unofficial estimates cite a 30% unemployment rate. Education and literacy rates and measures of social well-being are relatively high compared to other countries with similar incomes. Jordan's population growth rate has declined in recent years and is currently 2.3% as reported by the Jordanian Government. One of the most important factors in the government's efforts to improve the well-being of its citizens is the macroeconomic stability that has been achieved since the 1990s. Jordan's 2008 and 2009 budgets emphasized increases in the social safety net to help people most impacted by high inflation, but these increases were not included in the 2010 budget because of fiscal austerity plans and the low inflation rates during 2009. The average rate of inflation in 2009 was -0.1%. The currency has been stable with an exchange rate fixed to the U.S. dollar since 1995 at JD 0.708 to the dollar. In 2008, Jordan participated in a Paris Club debt buyback to retire more than $2 billion in debt using privatization proceeds which, at the time, reduced the percentage of external debt to GDP from 46% to 32%. While pursuing economic reform and increased trade, Jordan's economy will continue to be vulnerable to external shocks and regional unrest. Without calm in the region, economic growth seems destined to stay below its potential. Jordan's conservative banking sector was largely protected from the worldwide financial crisis but many businesses, particularly in the tourism and real estate sector, experienced a slowdown in 2009. Jordan has consistently followed a pro-Western foreign policy and traditionally has had close relations with the United States. 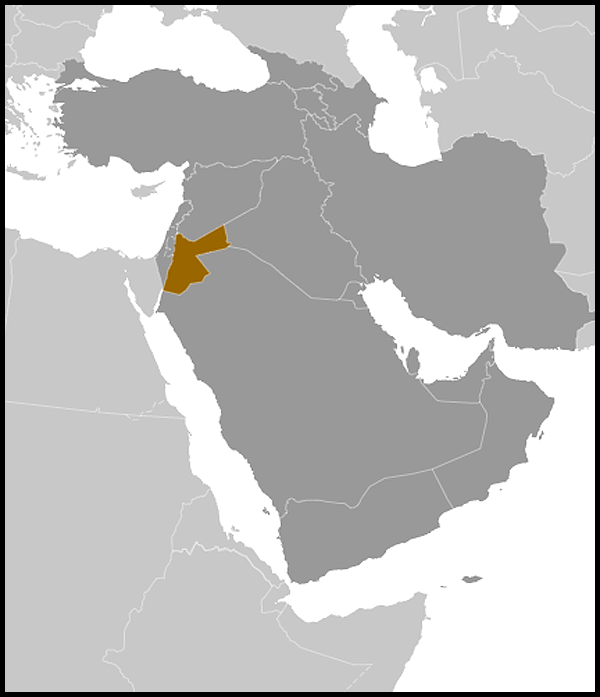 These relations were damaged by support in Jordan for Iraq during the first Gulf war (1990-91). Although the Government of Jordan stated its opposition to the Iraqi occupation of Kuwait, popular support for Iraq was driven by Jordan's Palestinian community, which favored Saddam as a champion against Western supporters of Israel. Following the first Gulf war, Jordan largely restored its relations with Western countries through its participation in the Middle East peace process and enforcement of UN sanctions against Iraq. Relations between Jordan and the Gulf countries improved substantially after King Hussein's death. Since the 2003 fall of the Iraqi regime, Jordan has played a pivotal role in supporting the restoration of stability and security to Iraq. The Government of Jordan has facilitated the training of over 50,000 Iraqi police cadets and corrections officers at a Jordanian facility near Amman. Jordan also plays host to a significant Iraqi population and has worked closely with donor agencies and the international community to address their humanitarian needs. In 2008, Jordan appointed and sent an ambassador to Iraq in an effort to strengthen bilateral ties. Jordan signed a nonbelligerency agreement with Israel (the Washington Declaration) in Washington, DC, on July 25, 1994. Jordan and Israel signed a historic peace treaty on October 26, 1994, witnessed by President Bill Clinton. The U.S. has participated with Jordan and Israel in trilateral development discussions in which key issues have been water-sharing and security; cooperation on Jordan Rift Valley development; infrastructure projects; and trade, finance, and banking issues. Jordan also participates in multilateral peace talks. Jordan belongs to the UN and several of its specialized and related agencies, including the World Trade Organization (WTO), the International Meteorological Organization (IMO), Food and Agriculture Organization (FAO), International Atomic Energy Agency (IAEA), International Civil Aviation Organization (ICAO), and World Health Organization (WHO). Jordan also is a member of the World Bank, International Monetary Fund (IMF), Organization of Islamic Cooperation (OIC), Nonaligned Movement, and Arab League. Since the outbreak of the second Intifada in September 2000, Jordan has worked to maintain lines of communication between the Israelis and the Palestinians to counsel moderation and to return the parties to negotiations of outstanding permanent status issues. These efforts bore fruit with the resumption of Israeli-Palestinian peace negotiations at the November 2007 Annapolis conference. Jordan has played an important role in facilitating the peace process through the training of several thousand Palestinian security force personnel. The current violence in neighboring Syria poses considerable challenges for Jordan. While the King has denounced the violence, 60% of Jordan's overland trade transits Syria, tribal and family affiliations are cross-boundary, and several thousand Jordanian students study in Syria. Syrian refugees continue to flee into Jordan. Relations between the United States and Jordan have been close for 6 decades, with 2009 marking the 60th anniversary of U.S.-Jordanian ties. A primary objective of U.S. policy has been the achievement of a comprehensive, just, and lasting peace in the Middle East. U.S. policy seeks to reinforce Jordan's commitment to peace, stability, and moderation. The peace process and Jordan's opposition to terrorism parallel and indirectly assist wider U.S. interests. Accordingly, through economic and military assistance and through close political cooperation, the United States has helped Jordan maintain its stability and prosperity. Since 1952 the United States has worked closely with Jordan to improve the lives of Jordanian citizens. Development assistance totaling nearly $6 billion has resulted in dramatically improved health indicators, road and water networks, hundreds of schools built, thousands of Jordanians in critical fields educated and trained in the U.S., and grants and loans for U.S. agricultural commodities. Current focus areas include education, access to water, resource management and conservation, energy, youth and poverty alleviation programs, maternal/child health, energy, governance, macroeconomic policy, workforce development, and competitiveness. These programs are an essential contributor to a strong bilateral relationship centered on a stable, reform-oriented Jordan. Jordan signed a Threshold Agreement with the Millennium Challenge Corporation (MCC) in October 2006, and was subsequently deemed by the MCC to be eligible for a Compact Agreement in recognition of the country's progress on economic, social, and political reform indicators. A strong U.S. military assistance program is designed to meet Jordan's legitimate defense needs, including preservation of border integrity and regional stability through the provision of materiel and training. In 2008, the U.S. and Jordan signed a non-binding memorandum of understanding (MOU) to provide assistance to Jordan over a 5-year period, subject to the appropriation and availability of funds for this purpose. The MOU also reinforces the commitment to broaden cooperation and dialogue in a variety of areas. The U.S. Embassy (http://jordan.usembassy.gov/) in Jordan is located in Abdoun, Amman (tel. 962-6-590-6000) and is closed on all U.S. federal holidays and some Jordanian holidays. Embassy office hours are Sunday through Thursday, 8:00 a.m. to 4:30 p.m.